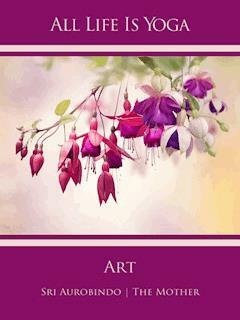 Flower on the cover: Fuchsia. Several coloursSpiritual significance and explanation given by the Mother:ArtLiving only to express beauty. This is one in a series of some e-books created by SRI AUROBINDO DIGITAL EDITION and published by AURO MEDIA under the title All Life Is Yoga. Our effort is to bring together, from Sri Aurobindo and the Mother, simple passages with a practical orientation on specific subjects, so that everyone may feel free to choose a book according to his inner need. The topics cover the whole field of human activity, because true spirituality is not the rejection of life but the art of perfecting life. While the passages from Sri Aurobindo are in the original English, most of the passages from the Mother (selections from her talks and writings) are translations from the original French. We must also bear in mind that the excerpts have been taken out of their original context and that a compilation, in its very nature, is likely to have a personal and subjective approach. A sincere attempt, however, has been made to be faithful to the vision of Sri Aurobindo and the Mother. The excerpts from the writings of Sri Aurobindo and the Mother carry titles and captions chosen by the editor, highlighting the theme of the excerpts and, whenever possible, borrowing a phrase from the text itself. The sources of the excerpts are given at the end of each issue. We hope these e-books will inspire the readers to go to the complete works and will help them to mould their lives and their environments towards an ever greater perfection. VI. Who is an Artist? X. Why is Modern Art Ugly? If Art‘s service is but to imitate Nature, then burn all the picture galleries and let us have instead photographic studios. It is because Art reveals what Nature hides, that a small picture is worth more than all the jewels of the millionaires and the treasures of the princes. If you only imitate visible Nature, you will perpetrate either a corpse, a dead sketch or a monstrosity; Truth lives in that which goes behind and beyond the visible and sensible and sensible. — SRI AUROBINDO. Beauty is the way in which the physical expresses the Divine – but the principle and law of Beauty is something inward and spiritual which expresses itself through the form. — Sri Aurobindo. Man’s seeking after beauty reaches its most intense and satisfying expression in the great creative arts, poetry, painting, sculpture, architecture, but in its full extension there is no activity of his nature or his life from which it need or ought to be excluded, – provided we understand beauty both in its widest and its truest sense. A complete and universal appreciation of beauty and the making entirely beautiful our whole life and being must surely be a necessary character of the perfect individual and the perfect society. But in its origin this seeking for beauty is not rational; it springs from the roots of our life, it is an instinct and an impulse, an instinct of aesthetic satisfaction and an impulse of aesthetic creation and enjoyment. Starting from the infrarational parts of our being, this instinct and impulse begin with much imperfection and impurity and with great crudities both in creation and in appreciation. It is here that the reason comes in to distinguish, to enlighten, to correct, to point out the deficiencies and the crudities, to lay down laws of aesthetics and to purify our appreciation and our creation by improved taste and right knowledge. While we are thus striving to learn and correct ourselves, it may seem to be the true law-giver both for the artist and the admirer and, though not the creator of our aesthetic instinct and impulse, yet the creator in us of an aesthetic conscience and its vigilant judge and guide. That which was an obscure and erratic activity, it makes self-conscious and rationally discriminative in its work and enjoyment. But again this is true only in restricted bounds or, if anywhere entirely true, then only on a middle plane of our aesthetic seeking and activity. Where the greatest and most powerful creation of beauty is accomplished and its appreciation and enjoyment rise to the highest pitch, the rational is always surpassed and left behind. The creation of beauty in poetry and art does not fall within the sovereignty or even within the sphere of the reason. The intellect is not the poet, the artist, the creator within us; creation comes by a suprarational influx of light and power which must work always, if it is to do its best, by vision and inspiration. It may use the intellect for certain of its operations, but in proportion as it subjects itself to the intellect, it loses in power and force of vision and diminishes the splendour and truth of the beauty it creates. The intellect may take hold of the influx, moderate and repress the divine enthusiasm of creation and force it to obey the prudence of its dictates, but in doing so it brings down the work to its own inferior level, and the lowering is in proportion to the intellectual interference. For by itself the intelligence can only achieve talent, though it may be a high and even, if sufficiently helped from above, a surpassing talent. Genius, the true creator, is always suprarational in its nature and its instrumentation even when it seems to be doing the work of the reason; it is most itself, most exalted in its work, most sustained in the power, depth, height and beauty of its achievement when it is least touched by, least mixed with any control of the mere intellectuality and least often drops from its heights of vision and inspiration into reliance upon the always mechanical process of intellectual construction. Art-creation which accepts the canons of the reason and works within the limits laid down by it, may be great, beautiful and powerful; for genius can preserve its power even when it labours in shackles and refuses to put forth all its resources: but when it proceeds by means of the intellect, it constructs, but does not create. It may construct well and with a good and faultless workmanship, but its success is formal and not of the spirit, a success of technique and not the embodiment of the imperishable truth of beauty seized in its inner reality, its divine delight, its appeal to a supreme source of ecstasy, Ananda. There have been periods of artistic creation, ages of reason, in which the rational and intellectual tendency has prevailed in poetry and art; there have even been nations which in their great formative periods of art and literature have set up reason and a meticulous taste as the sovereign powers of their aesthetic activity. At their best these periods have achieved work of a certain greatness, but predominantly of an intellectual greatness and perfection of technique rather than achievements of a supreme inspired and revealing beauty; indeed their very aim has been not the discovery of the deeper truth of beauty, but truth of ideas and truth of reason, a critical rather than a true creative aim. Their leading object has been an intellectual criticism of life and nature elevated by a consummate poetical rhythm and diction rather than a revelation of God and man and life and nature in inspired forms of artistic beauty. But great art is not satisfied with representing the intellectual truth of things, which is always their superficial or exterior truth; it seeks for a deeper and original truth which escapes the eye of the mere sense or the mere reason, the soul in them, the unseen reality which is not that of their form and process but of their spirit. This it seizes and expresses by form and idea, but a significant form, which is not merely a faithful and just or a harmonious reproduction of outward Nature, and a revelatory idea, not the idea which is merely correct, elegantly right or fully satisfying to the reason and taste. Always the truth it seeks is first and foremost the truth of beauty, – not, again, the formal beauty alone or the beauty of proportion and right process which is what the sense and the reason seek, but the soul of beauty which is hidden from the ordinary eye and the ordinary mind and revealed in its fullness only to the unsealed vision of the poet and artist in man who can seize the secret significances of the universal poet and artist, the divine creator who dwells as their soul and spirit in the forms he has created. The art-creation which lays a supreme stress on reason and taste and on perfection and purity of a technique constructed in obedience to the canons of reason and taste, claimed for itself the name of classical art; but the claim, like the too trenchant distinction on which it rests, is of doubtful validity. The spirit of the real, the great classical art and poetry is to bring out what is universal and subordinate individual expression to universal truth and beauty, just as the spirit of romantic art and poetry is to bring out what is striking and individual and this it often does so powerfully or with so vivid an emphasis as to throw into the background of its creation the universal, on which yet all true art romantic or classical builds and fills in its forms. In truth, all great art has carried in it both a classical and a romantic as well as a realistic element, – understanding realism in the sense of the prominent bringing out of the external truth of things, not the perverse inverted romanticism of the “real” which brings into exaggerated prominence the ugly, common or morbid and puts that forward as the whole truth of life. The type of art to which a great creative work belongs is determined by the prominence it gives to one element and the sub-dual of the others into subordination to its reigning spirit. But classical art also works by a large vision and inspiration, not by the process of the intellect. The lower kind of classical art and literature, – if classical it be and not rather, as it often is, pseudo-classical, intellectually imitative of the external form and process of the classical, – may achieve work of considerable, though a much lesser power, but of an essentially inferior scope and nature; for to that inferiority it is self-condemned by its principle of intellectual construction. Almost always it speedily degenerates into the formal or academic, empty of real beauty, void of life and power, imprisoned in its slavery to form and imagining that when a certain form has been followed, certain canons of construction satisfied, certain rhetorical rules or technical principles obeyed, all has been achieved. It ceases to be art and becomes a cold and mechanical workmanship.